Welcome to Point Blank, the Action Movie RPG! You've seen the movies. Now play the game. This game does not try and reproduce real world violence. It gives you the chance to mow down bad guys with an Uzi in each hand while shrugging off whatever wounds they manage to inflict. In this game, the characters do not hesitate before entering a room full of heavily armed gangsters. They go diving through the window, firing in mid-air and landing on the ground in a combat roll before coming up to finish off those left alive. If you're hopelessly outgunned, bleeding from a dozen pistol wounds and in a building threatening to blow up, you know it's time to go to work. 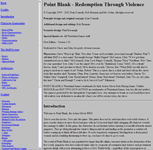 The world of Point Blank is one populated by larger than life villains; terrorists intent on the destruction of the free world, gangsters who have reduced entire cities to cesspools of corruption and violence and government agencies drunk with power attempting to force a New World Order - regardless of the consequences to freedom and democracy. In this world, the innocent die on the streets every day, crime is rife and concepts of Honour, Truth, Justice and Freedom have been forgotten as the millennium draws to a close. The players are the only thing standing in the way of a social apocalypse, the last honourable cops and killers in a world driven mad by greed and power. Point Blank is a violent game. We make no excuses for this. Like the action movies it represents, it thrives on high octane excitement and nail-biting suspense. Games should be fast-paced with characters making themselves stand out with their actions as well as their words. Style and memorable one-liners become the new forms of characterisation as the players place their characters own unique stamp on every encounter, each vying to turn each encounter into a quality scene worthy of inclusion into the best of action films. Inspired by the action films of Hong Kong, Point Blank gives the players the chance to play the roles of modern day action heroes. The rules allow characters to take risks they would normally think suicidal. In Point Blank, death holds no fear. Everyone dies at some point, it's what you do with your life that counts.